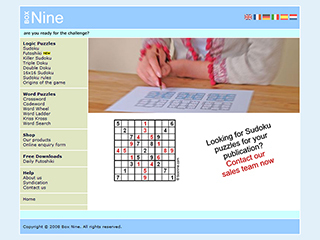 Box Nine are creators and suppliers of unique sudoku puzzles for newspaper and magazine publications. The design features a fixed width page centred within the screen. The colour scheme is a subtle blue, contained within white boxes to promote the box theme. Functionality includes sections for logic puzzles, word puzzles, free downloads, shop, and help. A new daily puzzle is provided within the free download section.